How to create mobile Icons in a matter of seconds with Mobile Icon Builder for Photoshop. Building Mobile Websites is a great business and using Icons for navigation is a one of the best ways to help people find their way around your mobile website. The problem is most of us are not graphic artists so to create individual icons for every site can be very time consuming. I have created this icon builder using Photoshop which speeds up the process a great deal and allows anyone to make great looking icons in seconds. 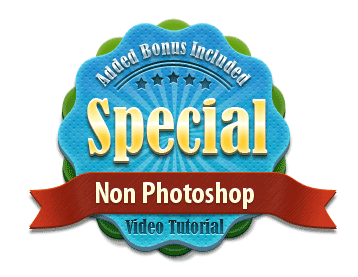 I have had it tested on all popular forms of Photoshop and as it is a standard PSD file should also work in any program allowing editable PSD Files. You can make Icons for your customers site over and over again. Here is exactly how it works. And of course when you create some icons why not come back here and show us. License: You can resell this product for $10 and rights only if the Zip file including the instruction video is retained. Tested on Photoshop 3,4,and 5 to date. Tried on Gimp and does not really work. Ok I have added an alternative not using photoshop now.